First, the good news: Starting today, anyone who’d rather stick to DVDs and skip the instant streaming can sign up for a new, $7.99 DVD-only plan. The bad news? Netflix has also decided to chuck its combined DVD-and-streaming plans, meaning that subscribers who want to rent DVDs and watch instant movies from Netflix will have to sign up for a two separate plans—and yes, expect to pay more in the bargain. The news comes via Netflix’s official company blog (which earlier announced that instant videos will again be sortable on Netflix’s website), with the upcoming plan changes slated to take effect immediately for new subscribers or “on or after” Sept. 1 for current members. Under the new plan, Netflix users who used to pay $9.99 for unlimited instant movies and a single at-home DVD will now pay a total of $15.98—or $7.99 for a “Watch Instantly” subscription and another $7.99 for the one-at-a-time DVD-only plan. f you want to rent both DVDs and stream videos from Netflix, here's what you'll be paying. Some of Netflix’s more expensive DVD-by-mail plans will also see price hikes when instant streaming is included, although the priciest plans will actually see price cuts once you add streaming into the mix. 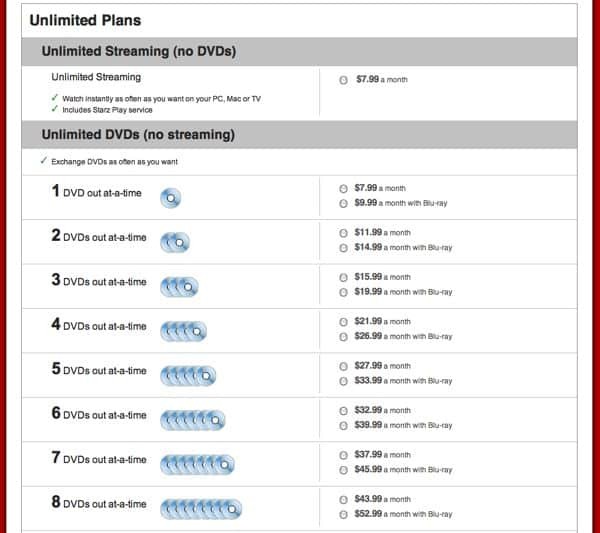 That said, getting six DVDs a month with unlimited streaming will now cost you $40.98 a month—about a buck less than the old 6 DVD/instant streaming combo plan. Once you head up to eight DVDs at a time with streaming, the new price will be $51.98 a month, or about $4 cheaper than the current price. But wait—there’s another wrinkle. If you want to rent Blu-ray discs with your Netflix account, kiss any price savings on the priciest plans goodbye, with the six-at-a-time DVD plan plus Blu-ray and streaming slated to cost $47.98 a month—an almost $6 monthly rate hike. For eight discs at a time, including Blu-ray and streaming, prepare to cough up $60.98, or about $5 more than the current rate. So, given the coming rate hikes, is Netflix still worth it? Let me know what you think!